What’s beautiful (and horrible to a person with OCD) about a landscape is the diversity you find within it. A landscape, at any scale, has a variety of different features that are clearly visible. The variety may be in color, in species composition, in successional stages, landforms, etc. This variety has been termed as patches; and a whole concept of patch dynamics revolves around how these patches behave and influence the landscape, at different scales and due to different processes. Patches of different crops being grown, with trees interspersed in between. Patches of forest within a grassland. A patch is defined in literature as an area in a landscape, that is different from surrounding areas (as clearly visible in the pictures above). A landscape is always made up of patches, thus giving it a patchwork look at a very large scale (see fig 1). These patches generate what is called landscape heterogeneity; diversity within a landscape. The diversity and uneven distribution that defines a landscape’s heterogeneity is based on many different features of an ecosystem; it’s species distribution, distribution of resources, difference in land-use patterns. Most of the large scale ecological problems we have are because of the absence of heterogeneity. This includes species extinction, increased intensity and frequency of natural disasters, improper land and resource management, and land degradation. Patch dynamics and landscape heterogeneity, function in every landscape at all scales and time periods. A small area of grass can have patches of no grass, creating heterogeneity. On the other hand, a huge forest may have patches of tall trees, short trees, no trees, and grasses, creating heterogeneity. The most common reason for the generation of patches and heterogeneity is natural disturbance. Events like fires and hurricanes affect a part of the entire landscape. This affected part will then be reverted to ground zero: no life. From there, it begins to develop life from small organisms, slowly progressing to grasses, shrubs and trees (this process over time is called succession). When you put in a number of disturbed parts (or patches) at different stages in their succession with different shapes and time frames, you develop landscape heterogeneity. A farmer wishes to begin agricultural activities on a hill slope with a small scale forest next to a river flowing. He would first clear a part of the land (disturbance) by cutting and/or burning it. This part would be subjected to cultivation. He would further alter the landscape by forming terraces (since it is a hill slope), affecting its topography. He would also divert river water into this cultivated area, affecting river flow and the associated riparian ecosystems. All of this would create a mosaic of patch with undisturbed forest, clear and symmetrical agricultural land, the natural flow of the river and the diverted canal. Dark green- undisturbed forest; ocher- cleared land for miscellaneous agricultural activities; yellow-agricultural land; orange-land affected by canal; black-canal; blue-water. Geomorphology has a long term influence on the landscape. Geomorphic processes control the formation of landforms and the distribution of these landforms in the landscape. Another long term control of landscape heterogeneity is climate. Everything from rainfall to wind patterns to temperature closely control the evolution of a landscape. Habits of animals in ecosystems also have a say in the evolution of heterogeneity. For example, the herbivores and grass eaters of the ecosystem would forage and graze their way through a landscape. These habits can clearly delineate patches of disturbed and undisturbed land. It also influences the generation of spaces which can be colonized by seeds of different plants. The presence of patches and heterogeneity is vital for the survival of the ecosystems in that landscape. I’ve explained why diversity is so important in nature; well, landscape heterogeneity is merely the diversity present in many ecosystems! A heterogeneous landscape ensures all the ecosystems present can tolerate and buffer large natural disturbances. Let’s take the example of a forest fire. Now, some trees like chirr pine are more susceptible to fires than other trees. If a forest was filled with just chirr pine trees (a homogeneous landscape), a fire in one corner would completely destroy the landscape! On the other hand, patches of different tree species in the entire landscape, along with chirr pine, would ensure that the fire is contained within the susceptible area only. A heterogeneous landscape allows for the support of different types of organisms. In the same case of a chirr pine forest, there are few herbivores that are specifically adapted to such a diet. Consequently, only the predators of these herbivores would be living in that area. This creates less species diversity and species richness, making the ecosystem susceptible to collapse. On the other hand, a forest with different tree species and grasses can support many different herbivores, consequently supporting different carnivores as well. More species diversity and species richness! When it comes to land-use by humans, a heterogeneous landscape helps us mimic the spatial patterns of a natural landscape. Thus, it helps us buffer many disasters that could affect the urban area. 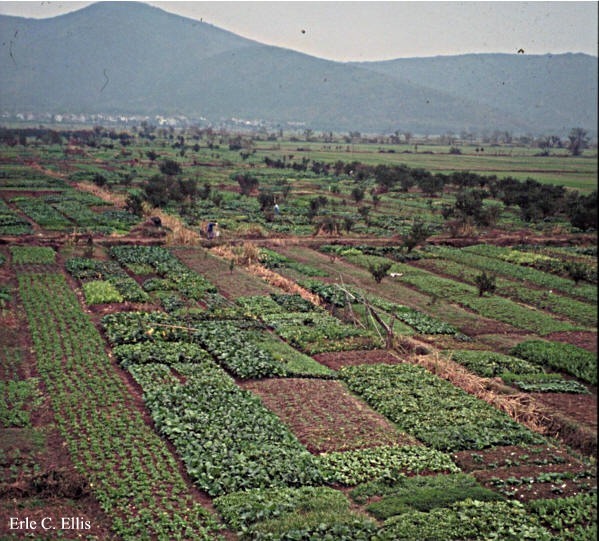 For example, clearing an entire slope for agriculture would create a homogeneous landscape of farms. If, say, a landslide were to occur on this slope, there would be nothing stopping it from obliterating the fields! If we were to instead clear only some parts of the slope for agriculture and leave the remaining undisturbed with forests, the trees of this forest would act as a buffer and stop the impede the movement of soil down-slope. Maintaining landscape heterogeneity also helps us manage our natural resources of land, soil, water and vegetation effectively. It ensures long-term practices and sustainable practices. A heterogeneous landscape, with it’s mosaic of patches, are therefore integral to the survival of all the ecosystems (natural and human) in that landscape. Unfortunately, most of the large scale ecological problems we have are because of the absence of heterogeneity. This includes species extinction, increased intensity and frequency of natural disasters, improper land and resource management, and land degradation. This is another reason for the rise and importance of landscape ecology in the last decade. More on this in future posts! Note: Too much heterogeneity is also not a good thing. It can greatly hamper ecological processes due to discontinuity. Landscape Ecology: In theory and practice by Monica G. Turner, Robert H. Gardner and Robert V. O’Neill. PreviousSurfing and Science: A new partnership!